Saudi Arabia executed 47 people today in the biggest mass execution since 1980. Those executed include Sheikh Nimr al-Nimr, a prominent Shi'ite Muslim cleric. Some were beheaded, others shot. Don't worry, there's nothing to be concerned about, the executions were "even-handed". Please consider Saudi Arabia Executes Prominent Shia Cleric Nimr al-Nimr. The execution on Saturday morning of Sheikh Nimr al-Nimr, a staunch opponent of the ruling Al Saudi family, has further stirred sectarian tensions in the Gulf and triggered threats from regional rival Iran. The Iranian foreign ministry accused Saudi Arabia of supporting terrorist movements and extremists abroad while confronting domestic critics with oppression and execution. “The Saudi government will pay a high price for following these policies,” the Iranian foreign ministry said. One activist said that 45 of those executed were al-Qaeda members and sympathisers, with the other two being Shia. Many of the charges related to terrorist attacks that took place during the al-Qaeda insurgency that was put down a decade ago. Shia activists have denied that Sheikh Nimr was involved in violent resistance, but many Saudis argue that his incitement against the government was tantamount to terrorism and often defend his death sentence. The activist said the government probably executed Shia dissidents at the same time as al-Qaeda sympathisers to back its claim to be taking an even-handed approach in its crackdown down on terrorism. 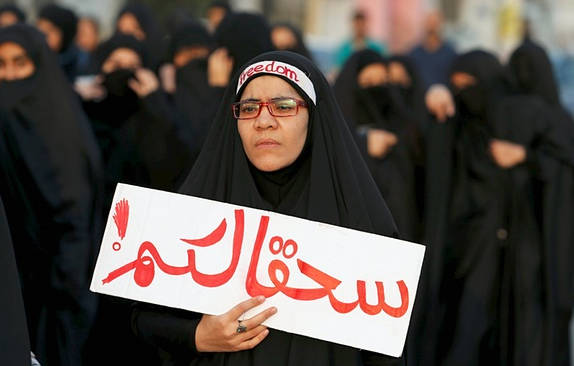 The Shia minority in the oil-rich eastern province has for years complained of discrimination. Sheikh Nimr al-Nimr's crime was speaking out against the government. In order to get rid of al-Nimr, Saudi Arabia had to get rid of 46 others, mostly Al Qaeda or alleged Al Qaeda sympathizers. As further proof of even-handedness, al-Nimr was not crucified for his alleged "mischief in the land." We would not want to crucify people for mischief would we? Beheadings are far more appropriate. The Telegraph reports Saudi 'will pay high price' for execution of top Shia cleric, warns Iran. Saudi Arabia executed prominent Shia Muslim cleric Sheikh Nimr al-Nimr on Saturday, stirring a chorus of condemnation and sectarian anger across the region. Nimr was a talismanic figure in protests that broke out in 2011 in the Sunni-ruled kingdom's east, where the Shia minority complains of marginalisation. His arrest in July 2012 sparked days of protest. Hundreds of Shias marched through Nimr’s home district of Qatif in protest at the execution, eyewitnesses told Reuters news agency, chanting "down with the Al Saud" in reference to the Saudi ruling family. Describing the executions as acts of “mercy” to prisoners who might have committed crimes on their release, Saudi Arabia's leading cleric, Grand Mufti Sheikh Abdulaziz Al Sheikh, said they were carried out in line with Islamic law and the need to safeguard the kingdom's security. There you have it. Not only were the executions "even handed", they were also "acts of mercy". Iran: Iran’s foreign ministry spokesman accused Riyadh of hypocrisy. "The Saudi government supports terrorist movements and extremists, but confronts domestic critics with oppression and execution," said Hossein Jaber Ansari. Lebanon: Lebanon's Supreme Islamic Shia Council called the execution a "grave mistake"
Iraq: Iraqi Prime Minister Haider al-Abadi said it would have repercussions on regional security. Germany: A German foreign ministry official said Nimr’s execution strengthened “existing concerns about increasing tensions and deepening rifts in the region”. UK: From Guardian: Liberal Democrat leader, Tim Farron, responded to news of the executions by describing capital punishment as abhorrent, and called on the prime minister to do more to pressure foreign governments into abolishing the death penalty. Britain’s shadow foreign secretary, Hilary Benn, described the execution as “profoundly wrong”. However, "prime minister David Cameron insists UK must have close ties with Saudi Arabia". Bahrain: Striking image from one of the protests in Bahrain. The banner reads “to hell with you”. In the US, there was deafening silence from president Obama as well as our state department. And why not? After all, those executions were "even-handed acts of mercy" by our Saudi friends. What else can possibly be said? When your friends sponsor terrorism and execute their own citizens simply for being dissidents, you just have to look away. Friends must be friends, otherwise they aren't friends. And in the drive for perpetual war, Saudi Arabia is the biggest friend we have.